It’s hard to believe that the end of summer is here but along with crisper temperatures and falling leaves, autumn brings a whole slew of events to keep us occupied. Whatever your hobbies, you can find an event as eclectic and unique as you are. Did you know that the Beer Series at THE MUSEUM started again on September 28th? Whether you like legos, science, DIY or just like to drink beer... this series is for you! Running monthly until the spring, check out their website for upcoming themes. And if you’re feeling some post-summer blues, cheer yourself up at a weekday comedy night! Experience the new show, LOL @ B, on Monday nights at THE MUSEUM or enjoy a classic Crooked Sword Tuesday at the Boathouse or Rusty Nail Thursday at Descendants. Running every week, this is the perfect ritual to get over your mid-week slump! This newsletter, CULTURED is showcasing another one of our fav shops that is consistently bringing us “good vibes”. 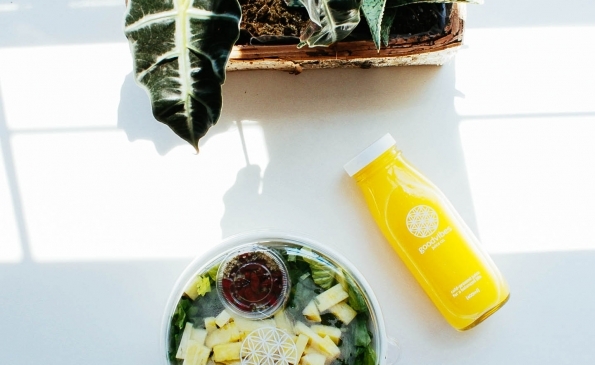 Goodvibes Juice co. is Kitchener-Waterloo’s first cold-pressed juice bar and is serving up juices, smoothies, salads and positivity on the daily. They are all about ensuring “the goods” – i.e. Your juices, smoothies, meals, etc. – are as nutrient rich, pure and delicious as nature intended. Everyone’s busy. So goodvibes offers delivery and subscription programs to help you get the nutrition you need, even on the busiest of days. Or stop by during your lunch break and say hi to the always smiling staff where you can sample new combos and learn more about the benefits of juicing!